Thinking about having a fun party for your kids? Birthday parties are very special to children. Parents plan these parties so all invited have a fun time. 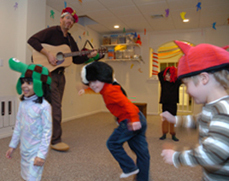 Robert Markowitz offers kid’s party entertainment for Westchester and Fairfield Counties for children of all ages. 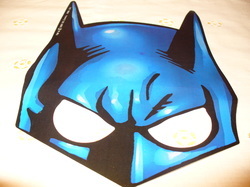 Robert uses creative play and movement to keep children entertained and helps to develop an enthusiasm for music. 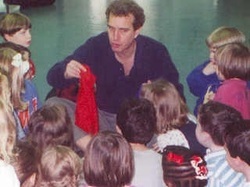 Robert uses jumping, dancing, and marching activities to hold the attention of children. 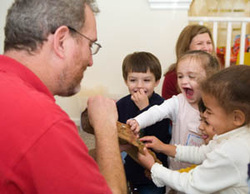 Drums, shakers, puppets, and bells are also introduced to add to the children’s enjoyment. Robert Markowitz guides these parties with his exceptional guitar talent and natural love of his work. His repertoire of over 75 children’s songs appeals to all age groups. He can individualize his music for each and every occasion. Robert Markowitz’s kid’s party entertainment for Fairfield and Westchester Counties provides children with a very special experience. 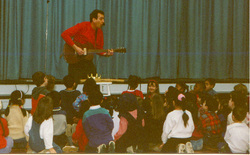 Robert Markowitz delivers an energetic musical show to delight children of all ages. Call to book Robert the Guitar Guy today for your child’s next birthday party or school event!